When you’re trying to ensure ideal website optimisation, duplicate content is the last thing you want. Knowing how to identify and fix this is a great way to improve your site’s visibility. Duplicate meta tags and data on different content, confusing Google searchbots. It goes without saying, then, that duplicate content is bad and can easily start to halt your SEO progress. 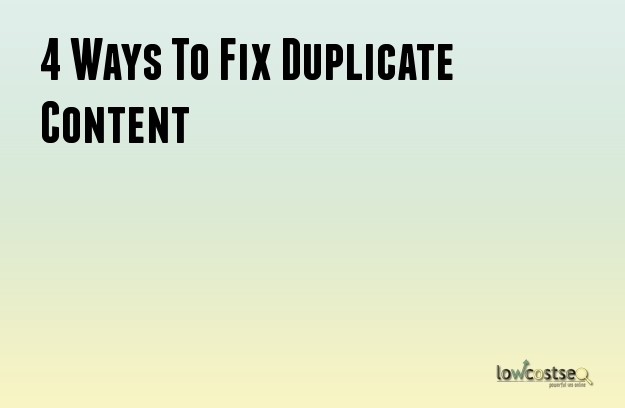 So, here are 5 ways to fix duplicate content. When planning any new website, all pages should have their own focal keyword in mind. This will help you push each page in a specific direction, ensuring no two pages are targeting the same keyword (if they are, then it might be worth merging the two). Of course, this isn’t always possible in older, existing websites. As such, it’s common to find duplicate keywords. There are many online tools to showcase what pages are attracting what keywords. Sometimes, you might find that the page you want listed actually appears under a second page you weren’t aware of. The solution? Use your robots and index filing to redirect. There are numerous listings services online and, much like search engines results, these can confuse Google. If it has to choose between duplicate listings, it will often display both at a much lower position. Fortunately, there are plenty of tools to identify and remove duplicate listings. This is important as, unlike the other factors on this list, these are often external and beyond your usual realm of control. This is often one of the hardest truths for webmasters to learn but, sometimes, you need to delete old content. Your older content is likely not up to date and, depending on the nature of the content, might not even be relevant. Considering that there’s a limited amount of keywords, it’s worth noting that, the more content you create, the more inevitable it is that you start tripping over yourself. In addition to redirects, deleting poor quality content will bring further benefits. It can improve the overall authority and ranking of your website, as well as free-up keywords for more important pages. If a search engine crawls your site and finds the same page with different URLs, it won’t instinctively know these are the same page. It may see them as different pages, ranking them negatively as a result. This is quite common in commercial sites, whether its due to website navigation or even just having every product page in both HTTP and HTTPS variants. For the latter, a simple redirect should work (it’s best to prioritise the secure sockets HTTPS). For other issues, you should address how your website generates these links, streamlining the process. When your site generates a near endless variety of links, it’s not possible to just ‘redirect’ all of them.